After the purple travel gown I thought I would take it easy with sewing complicated things for a while, but then I got invited to an 18th century event, including a masked ball. 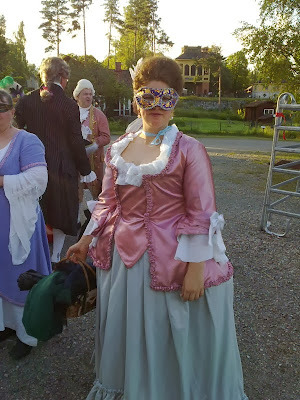 I hadn't done any historical costumes since my failed pink ballgown, but I had always wanted to do some 18th century. With the time frame I had I realized that I wouldn't be able to make anything too complicated, but I still wanted to give it a try. 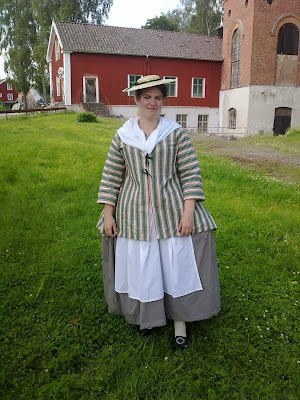 I also was lucky in that I already had a pair of stays, 18th century corset, that I used under the purple travel gown. In the end managed to whip up two costumes in less than a month. As mentioned I already had a pair of stays and I used this pattern to make a pair of pocket hoops. The shape was really good, but for some reason they had a tendency to collapse. If I go back to this style of dress I will definitely make a new set of pocket hoops and see if I can figure out what didn't work with this first pair. The under garments were the same for the two costumes, and then I made one day and one evening ensemble. The day ensemble was a simple jacket, made out of a pair of curtains I found at my mother's home. I was very happy when I went to the V&A museum in London later that autumn and found a jacket in very similar colours and stripes. This is actually the most accurate of the two costumes that I made, even if it isn't the most flattering for any figure. I used the these instructions from Durán Textiles. It is lined with unbleached cotton. 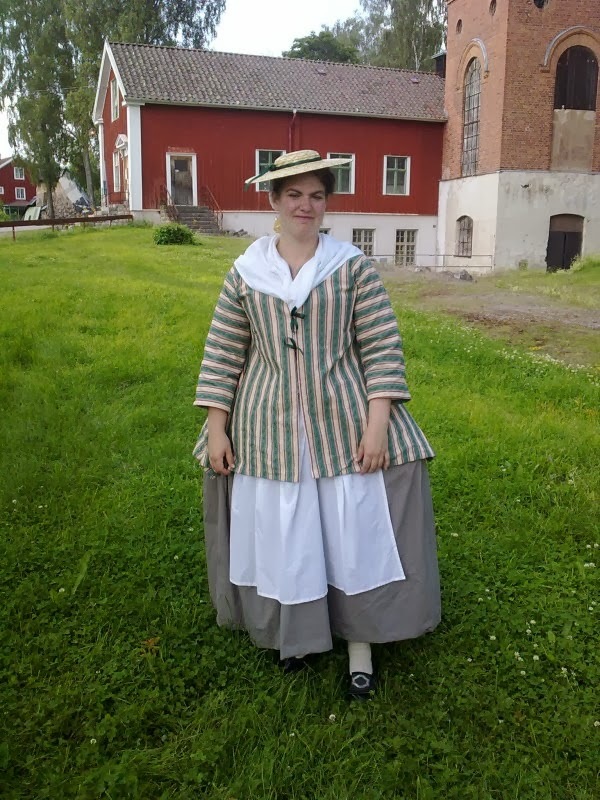 The petticoat was made from fabric I found on sale, and the only thing I spent some money on was the straw hat. I also added a fichu and apron, out of cotton voile to complete the ensemble. The other costume was a fancier jacket. Or rather it looks fancier, when in fact it's less accurate and I did a lot more of experiments with it. For this I actually cut up the skirt from my 1860s ballgown and cut up the fabric. This was a test, so I didn't care that much about the quality of the fabric, and in fact I've already cut up the jacket to use the sleeves as a pattern for other 18th century gowns. The pattern was the jacket C from Pattern of Fashions I, page 26. My sister had this pattern, but she's a petite and I'm not. We enlarged the pattern, and I think it worked ok. It got a bit small, so I had to add a stomacher in the front, but the sleeves were really good. All the wrinkles come from the fact that there is no boning in the front so it isn't stretched properly, and the awful satin of course wrinkles if you only look at it. To pimp the jacket a bit I added some white voile that I cut up and simply gathered to make a collar, and some more of the voile was used to make the flounces. The skirt was also fabric on sale, I found it online and thought that it would be a lot more blue than it was. Still I like the skirt and would definitely like to make a new jacket to go with it some day. I'm not going to use the jacket again, I have lent it to a friend who wanted to try 18th century once, but I have journeyed on from this first attempt. I have cut out the lining of the sleeve so that I will be able to use that sleeve as a pattern for any future sleeves though, since this is my best historical sleeve pattern so far.